Tachyglossus aculeatus, the short-nosed echidna, is one of three extant members of Monotremata, the others being Zaglossus bruijni and Ornithorhynchus anatinus. Monotremes, or the egg-laying mammals, are named for the single common opening for the urogenital and digestive systems. Most phylogenetic analyses based on morphological and molecular data place Monotremata as the sister taxon to Theria (Placentalia + Marsupialia) among the major clades of living mammals. An alternative hypothesis based on molecular and morphological data places Monotremata as the sister taxon to Marsupialia (Gregory, 1947; Penny and Hasegawa, 1997). Tachyglossus is native to Australia, Tasmania, and central and southern New Guinea. The fossil record of echidnas is poor only extending back to the Pleistocene of Australia and New Guinea (Murray, 1978; Griffiths et al., 1991). The short-nosed echidna lives in a variety of terrestrial habitats and shelters in burrows or caves. Tachyglossus is nocturnal and crepuscular in activity. It rarely enters torpor during cold weather but rather uses shivering for thermoregulation. Ants and termites comprise the majority of the diet of this animal (Nowak, 1991). Echidnas, also known as spiny anteaters, are covered by hollow spines that are essentially modified hairs. The body is rounded and dorsoventrally compressed ending in a short tail. The legs are short and stout each ending in feet with five digits that terminate in elongated claws. The most prominent feature on the head is the elongate, hairless snout. The mouth is toothless and contains a long, sticky tongue. 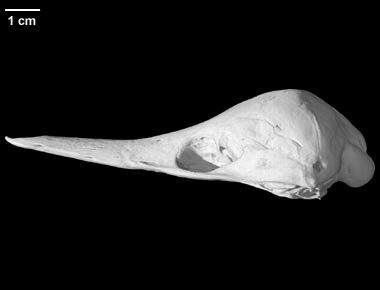 The skull of Tachyglossus is characterized by an elongate, rounded snout and a laterally bulging braincase. The palate extends back to the level of the ears. The ectotympanic is oriented horizontally, and the external auditory meatus is directed ventrally. The lower jaw is reduced and has poorly developed coronoid and angular processes. Internally, the most prominent features are the turbinates. They extend far posteriorly in the skull (see 3D model), underlying the olfactory and cerebral cavities of the braincase. This specimen was collected from the Iron Range Airport, Cape York, Australia by Gordon Strip on 22 June 1948. It was made available to the University of Texas High-Resolution X-ray CT Facility for scanning by Mr. Ted Macrini of the Department of Geological Sciences, The University of Texas at Austin. Funding for scanning was provided by a National Science Foundation Dissertation Improvement Grant (DEB-0309369) to Mr. Macrini. Funding for image processing was provided by a National Science Foundation Digital Libraries Initiative grant to Dr. Timothy Rowe of The University of Texas at Austin. This specimen was scanned by Matthew Colbert on 31 October 2003 along the coronal axis for a total of 693 slices. Each slice is 0.15 mm thick, with an interslice spacing of 0.15 mm and a field of reconstruction of 47.0 mm. The skull and mandible were scanned together but separated for image processing. Augee, M. L. (ed.) 1978. Monotreme biology. The Australian Zoologist 20, part 1. Augee, M. L. (ed.) 1992. Platypus and echidnas. Royal Zoological Society of New South Wales, Mosman, 296 pp. Gregory, W. K. 1947. The monotremes and the palimpsest theory. Bulletin of the American Museum of Natural History 88:5-52. Griffiths, M. 1968. Echidnas. Pergamon Press, New York, 282 pp. Griffiths, M. 1978. The biology of the monotremes. Academic Press, New York, 367 pp. Jørgensen, J. M., and N. A. Locket. 1995. The inner ear of the echidna Tachyglossus aculeatus: the vestibular sensory organs. Proceedings of the Royal Society of London B 260: 183-189. Kuhn, H.-J. 1971. Die Entwicklung und Morphologie des Schädels von Tachyglossus aculeatus. Abhandlungen der Senckenbergischen Naturforschenden Gesellschaft 528: 1-224. Lyne, G. 1967. Marsupials and monotremes of Australia. Taplinger Publishing Company, New York, 72 pp. Murray, P. F. 1978. Late Cenozoic monotreme anteaters; pp. 29-55 in: Monotreme biology. The Australian Zoologist 20, part 1. Penny, D., and M. Hasegawa. 1997. The platypus put in its place. Nature 387:549-550. Watson, D. M. S. 1916. The monotreme skull: a contribution to mammalian morphogenesis. Philosophical Transactions of the Royal Society of London B 207:311-374. Click on the thumbnail to the left for a pitch animation (1.1 mb) of the Tachyglossus cranial endocast highlighted in red within the skull, which is rendered semi-transparent. Click on the thumbnail to the left for a pitch animation (1.1 mb) of the isolated Tachyglossus cranial endocast. Click on the thumbnail to the left for a roll animation (1.4 mb) of the Tachyglossus cranial endocast highlighted in red within the skull, which is rendered semi-transparent. Click on the thumbnail to the left for a roll animation (1.8 mb) of the isolated Tachyglossus cranial endocast. To cite this page: Dr. Ted Macrini, 2004, "Tachyglossus aculeatus" (On-line), Digital Morphology. Accessed April 25, 2019 at http://digimorph.org/specimens/Tachyglossus_aculeatus/skull/.